We may have all heard of Town Hall 8.5, but what exactly IS it? Town Hall 8.5 is used for war, and I’m here to today to help you guys understand exactly what TH 8.5 is. These don’t impact a war matchup too much and they are important to a Town Hall 9. You don’t buy new buildings, but you upgrade the ones you do have! This helps your clan get an easier matchup in war because it appears you are still a Town Hall 8, but with a queen. Basically, TH 8.5 is used to make war matches easier. By not building any of your new buildings, you will get easier matches, but you will have TH9 troops. You shouldn’t buy any new buildings besides the ones mentioned already, but you should upgrade your preexisting ones and your heroes. You should have the amount of buildings that a Town Hall 8 has, but the level of buildings of a Town Hall 9. Upgrading troops are the most important thing will becoming a Town Hall 8.5; you need to have a TH8 base, but TH9 troops. 1. First you should build the few structures that you are supposed to build; your new traps and walls plus your Archer Queen. 3. Begin to upgrade Clan Castle and army camps. This will again help you attack better in war. Remember, the whole idea behind TH 8.5 is having a Town Hall 9 attacking ability, but being counted as a Town Hall 8 in war matching. 4. Start upgrading the all of your defenses. I would start with teslas, since those don’t seem to count as much in war matchmaking, then cannons/archer towers. If you follow all of these guidelines, being a Town Hall 8.5 can make the difference in a war. 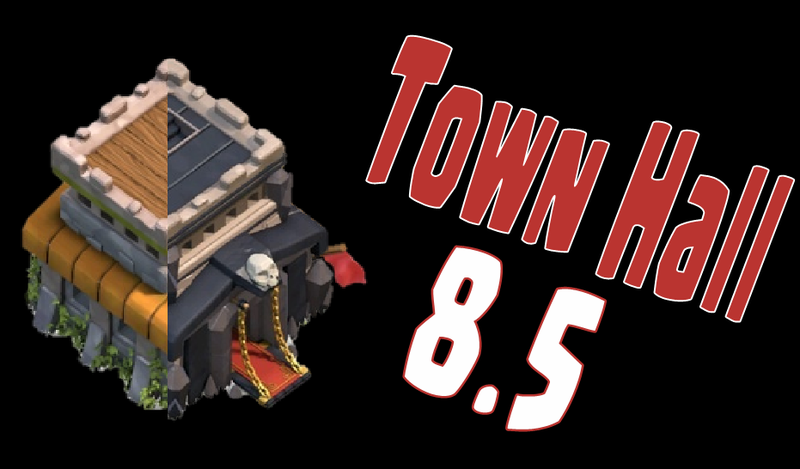 If you are serious war player at Town Hall 8, consider becoming an 8.5! Thanks for reading guys! nope , tesla have huge weight . the defence with the least weight are the air defences . Upgrading walls has a huge effect on War Weight, I would not upgrade that first.